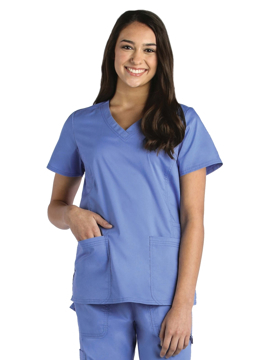 This mock wrap top features two patch pockets, left front sectional pocket, knit front and back side panels, signature logo rivets, and side vents. Center back length: 26". 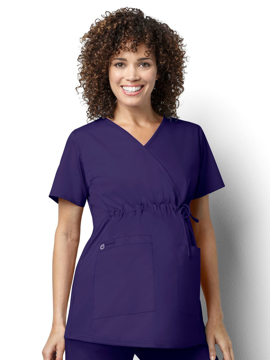 A contemporary fit v-neck top features front patch pockets (the right with an exterior pocket and pencil stitch, the left with a hidden instrument loop), side vents, and stretch rib knit at the neckline and back side panels for movement and extra comfort. Center back length: 27". 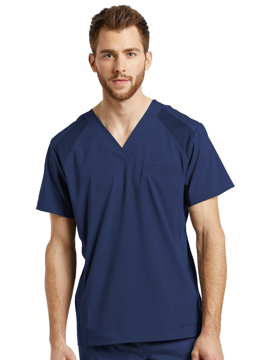 Men’s fit top features a chest pocket with a D-ring and one pocket on the left sleeve with additional self loops for holding pens. Set-in sleeves, front and back yokes, multi-needle topstitching and side panels complete this top. Center back length: 29½". 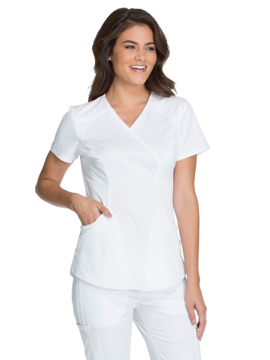 This contrast v-neck top features two shaped patch pockets, cellphone pocket, sporty contrast side and back panels, and modern styling with reflective details. Center back length: 24½". This stylish v-neck top features stretch side panels, two patch pockets, and ribbon details for styling. Center back length: 25". This warm-up jacket features a full zipper front with stand-up collar, quilted tri-blend side panels, curved top-loading pockets, and straight contemporary sleeve style. Center back length: 26". This pant features a contoured yoga waistband, side panel insets on waistband, secure side leg welt pocket, and a 19" leg opening. Regular inseam: 31½". Petite inseam: 29½". Tall inseam: 33½". T-shirt styled v-neckline with embossed panel in back neck. Two top loading welt pockets made to hold all your gear. Embossed front and back side panels. Move-with-you side vents. Reflective logo. Omni-stretch micro-pique moisture wicking fabric with anti-microbial odor control technology. Center back length: 25". This curved v-neck top features two front patch pockets, utility loop, cellphone pocket at side panel, floral print piping in back of neck, front princess seams, back yoke and darts for added style and shape, and side vents with decorative pieces. Center back length: 27¾". Round neck knit rib collar jacket. Mesh side panels. Front dyed-to-match nylon zipper. Half shell fabric and half rib trim cuff. Two curved front pockets. One side pocket with zipper and one side pocket with twill tape. Back yoke with self facing. Center back length: 27¾". Straight leg pant with side panels. Full elastic waistband with grommets for dyed-to-match drawstring. Two slant pockets with inner cell pocket. Side mesh piecing. Back yoke. Two back pockets with zipper. Regular inseam: 30½". Petite inseam: 28". Tall inseam: 33". Curved V-neck top. Mesh side panels. One side pocket with zipper and one side pockets with twill tape. Two curved front pockets. Curved back yoke with double needle stitching. Back yoke mesh panel with piping inside. Center back length: 27¾". 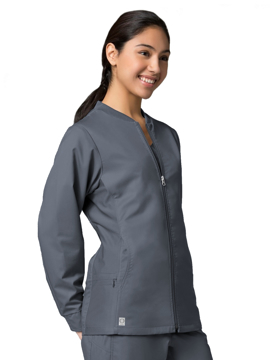 This warm-up jacket features a scoop neckline with front zip closure, shoulder and side panel detailing, two front patch pockets, back princess seams, and long sleeves with knit cuffs. Center back length: 26½". A knit racer back panel and streamlined side panels complement the classic shirttail hem detail. Triple needle stitch accentuate details and contrasting colors. V-neck and sporty racer back. Large patch pockets and right single went accessory pocket. Contrasting trim and hem vents. Center back length: 26". This empire waist top features contrast print at back neck and hem, quilted peek-a-boo cellphone pocket, two slant patch pockets, darts and seaming, quilted empire panel, Vera Bradley metal charm at empire seam, hidden utility tape, badge loop at right shoulder seam, and tonal thread to pop quilting. This top is named after Frida Khalo - an inspirational female painter. Center back length: 26¼". This v-neck top features quilted side panels, two slanted patch pockets, hidden utility tape, quilted cellphone pocket, badge loop, Vera Bradley metal charm by cellphone pocket, and tonal thread to pop quilting. This top is named after Nettie Stevens - an inspirational female geneticist. Center back length: 26¾". This slim-fitting Allure top, with its curved stretch-knit side panels and knit v-neck keeps you in your comfort zone. Center back length: 26¼". 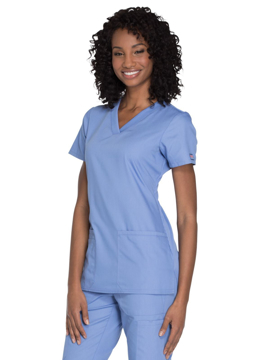 This knit panel v-neck top features two lower pockets including one WonderWink signature triple pocket with hidden mesh pocket, contour black knit side panels (Navy has navy panels), signature ID bungee loop, and invisible three part accessory loop. Center back length: 27¾". 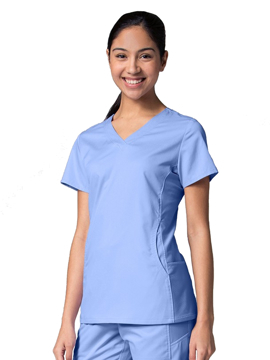 This v-neck top is slightly tailored throughout the body, and features the 37.5 technology infused fabric, a stylized chest pocket with pen slot, two lower pockets, double knit mesh inset on both sides of torso, deco flatlock stitching throughout garment, and dropped back shirt tail for coverage when moving. Center back length: 30¼". This straight leg pant features the 37.5 technology infused fabric, elastic waist with drawstring, button front with functional zipper fly, slim leg, double knit mesh insets at each side of back for ease of movement, deco flatlock stitching throughout garment, two front slant pockets with cell pocket, two cargo pockets with cell pocket, two back pockets, and bottom vents. Regular inseam: 31". Tall inseam: 34". 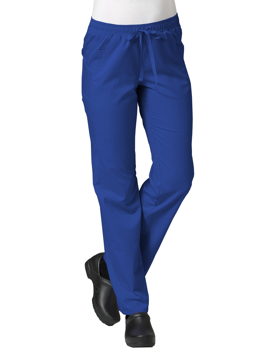 This straight leg pant features the 37.5 technology infused fabric, double knit mesh full elastic, flat front drawstring waist, slim leg, two front slant pockets, two stylized cargo pockets, two stylized back pockets, deco flatlock stitching throughout, double knit mesh insets at leg vents, and bottom vents. Regular inseam: 31". Petite inseam: 28½". Tall inseam: 33". 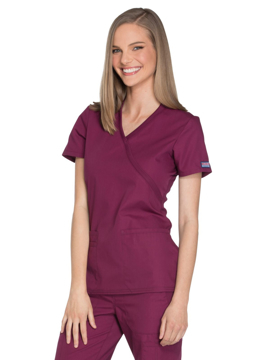 This v-neck top features 37.5 technology infused fabric, shaped forward shoulder seam, deco flatlock stitching at front, two stylized lower pockets, and shaped side panels with back vents. Center back length: 26¼". 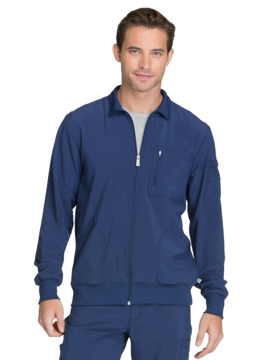 This warm-up jacket features the 37.5 technology infused fabric, slim stylized collar, deco flatlock stitching throughout the garment, two lower stylized pockets, double knit mesh convertible cuff, double knit mesh side panels, and elastic along the back hemline. Center back length: 26¾".